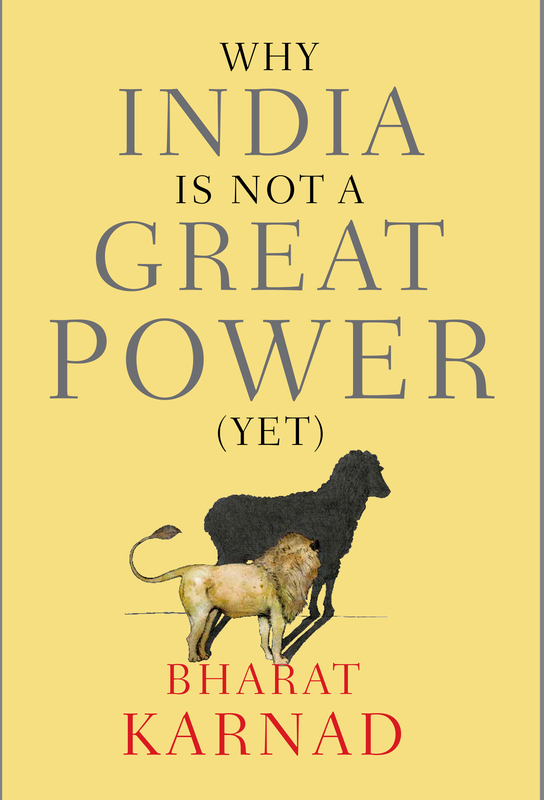 For those blog readers residing in and around Mumbai, pasted below is the invite to the Mumbai event to launch my book — ‘Why India is Not a Great Power (Yet)’hosted by the Asia Society, India chapter, at the Nehru Centre, Worli at 6 PM. The original invite accessible at http://www.asiasociety.org/india. Unfortunately, the technical capability for audio/video recording is unavailable for this event. Is India Soft Selling its Hard Power? Economic growth, demographics and soft power are all cited to substantiate India’s potential “great power” status. One of the factors that receives relatively little attention, however, is India’s military might. As nations manoeuvre the waters of geostrategic decisions, extending their influence through hard power and realpolitik, is India being left behind? Could greater vision and strategy in India’s military capabilities reinforce national objectives as it moves toward attaining the status of a “great power”? Join us as Bharat Karnad, Research Professor, Centre for Policy Research and Vice Admiral Madanjit Singh, Former Flag Officer Commanding-in-Chief, Western Naval Command explore this crucial aspect of foreign policy in a conversation centered on ‘Why India is Not a Great Power (Yet)’. Bharat Karnad is Professor of National Security Studies, Centre for Policy Research, New Delhi and author of ‘Why India is Not a Great Power (Yet)’. One of the foremost national security strategists of India, he has been a member of the National Security Advisory Board, the Nuclear Doctrine-drafting Group, and Adviser, Defence Expenditure (10th) Finance Commission, India. Vice Admiral Madanjit Singh was commissioned into the Indian Navy in January 1966, Vice Admiral Singh PVSM, AVSM, specialised in gunnery and missiles. Before taking charge as Flag Officer Commanding-in-Chief Western Naval Command, he was FOC-in-C, Southern Command. Among his various afloat and ashore appointments have been the command of five ships including the frigate INS Ganga and the aircraft carrier INS Viraat. For more information regarding membership at Asia Society, please do visit our memberships page. Copyright © 2015 Asia Society India Centre, All rights reserved. It would be great if you requested OUP to have a stall to sell copies of your book at the event itself. They have done that in the past for various Asia Society events. I had attended a talk by Brahma Chellaney and they had done so. OUP will have a stall at the site. The discussion at Nehru Centre about your book and India’s defence strategy was insightful as well as informative. I wanted to ask a question but due to paucity of time I couldn’t get the opportunity. I just have one simple question. Who amongst the four Prime Ministers -Narasimha Rao, Atal Behari Vajpayee, Dr. Manmohan Singh & Narendra Modi – is considered to be a deft practitioner of realpolitik and why? Sorry you couldn’t get to ask your Q. Of this lot, Narasimha Rao stands out. Many thanks for your response Mr. Karnad.